Selfies are everywhere, and there is always something happening on social media to encourage it. The no-makeup selfie to raise awareness for cancer in 2013 and Weight Watchers’ fitness selfies in 2015 are just two examples. While they can be fun, they do affect the self esteem. As a parent, you need to be aware how they can affect your teen’s self esteem, both positively and negatively. The teen self esteem can be affect positively by taking selfies on a regular basis, according to some children. A body image survey in 2015 showed that 65 percent of teens said they had a boost in their confidence by seeing the self-taken photos. 40 percent said that they could show off their best side, because they had full control over the photos being taken. By boosting their confidences, they are also boosting their self esteem. This pushes them to do more in life, and they are more likely to be social and positive in other walks of life. Selfies offer teens another method of self-expression. They need this to be able to work through their issues, while making memories for the future. The downside to these photos is that there is a pressure for teenagers, especially girls, to look good. There are lots of photos being taken in the celebrity universe that look perfect; as in the celebrities look like they have flawless skin. This is all thanks to computer generation, but teenagers feel the pressure to look that amazing. This can have a negative effect on the teen self esteem. They can take hundreds of self photos, only to find that they never have one that makes them look great. As a parent, it is important to talk to your son or daughter about images in the media. It is worth discussing the airbrushing techniques used. The benefit is that many celebrities will have taken their own selfies, posting them on their own social media accounts. Many of these will include their real blemishes, and it is worth discussing these with teenagers. Help boost their confidence by letting them see that even celebrities have some flaws. There are positives and negatives, but it is important to consider the comments that teens can receive for the images they post online. While positive comments will boost their self esteems, the negative ones will have the opposite effect. The downside is that people are negative for all sorts of reasons. Some people love to pick out faults, because they are embarrassed about their own. Some are jealous, and will look for something negative to say to make themselves feel better. Others are just being honest, trying to help people improve in some way. Cyber bullying is a growing problem, and selfies open the door for more bullies to attack. This is another area parents need to help their children. It is worth looking at your teen’s social media accounts and the comments being left. Some comments will be through private messaging, so keep an eye on the way your teen acts around the house or after school/social events. Cyber bullies can take screenshots of images, so they have them if the posted decides to delete them. The poorly timed or poorly decided photos can come back to haunt teens, and they need to be aware of this possibility as it could have a negative effect on their self esteems. There are mixed views on how selfies can affect the teen self esteem. While some teenagers say that they have a positive impact, because they have more control, there are some experts who view them as negative elements of a teen’s day. 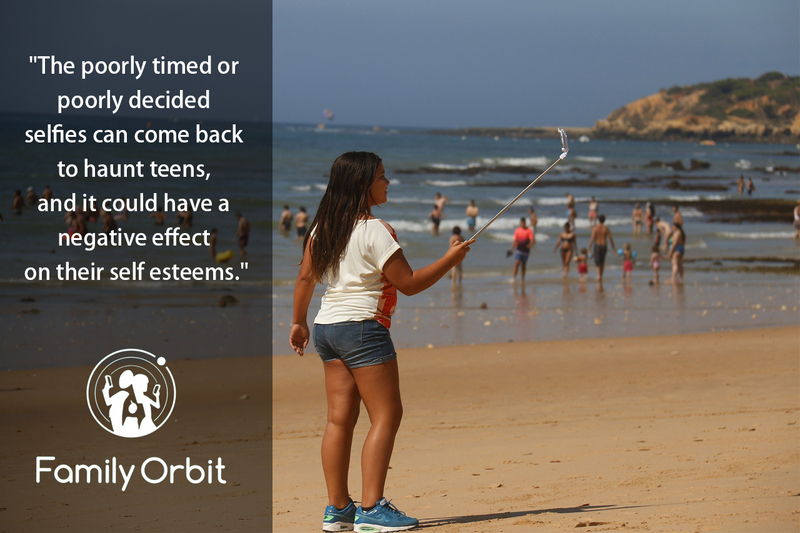 As a parent, you can monitor the selfies taken on your child’s smartphone with Family Orbit. That way, you can help boost your teen’s confidence with them, while making them aware of all the downsides attached to them.